It is time to enjoy or share your favorite music freely! EDIFIER now brings its brand-new TWS3. No more wires between the twin headphones! You can give one of them to a loved one, and enjoy your favorite song together at ease. EDIFIER TWS3 lasts for 3 hours on a single charge. Carrying the headphones steadily and firmly, the charging case can add an additional 9 hours of play- back time. All together the 12 hours playback keeps the music with you all day long. EDIFIER TWS3 adopts an ergonomic, light-weight design. The package also includes 3 pairs of soft silica gel ear tips and 3 pairs of ear holders, which ensures EDIFIER TWS3 to be comfortable and stable to wear. Compared with other true wireless earbuds, EDIFIER TWS3 emphasizes more on sound quality. The 8mm NdFeB is specially tuned for cavity with limited space. Supported by the high-resolution sound quality of CSR bluetooth chips, EDIFIER TWS3 is proud of its bright, natural highs, as well as the full, authentic midrange and bass. Meticulous manufacturing process, strict quality control, re-liability testing, environmental friendly materials, real-timemanagement? ?EDIFIER aims to bring you with absolutely high-quality earbuds. Equipped with Hall magnetic sensor, EDIFIER TWS3 is easy to use for everyone. 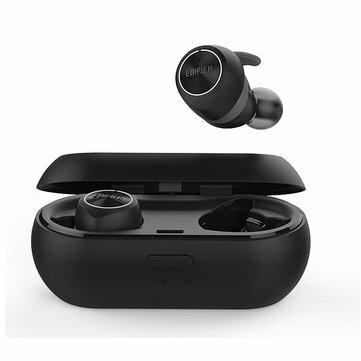 You just need to take them out of the charging case, and the headphones will be connected to your device automatically.Ready all the time to play your favorite music! EDIFIER TWS3 has upgraded to bluetooth V4.2. The CSR chips guarantee not only high-resolution sound quality, but also more stable connection and lower latency. As long as you stay within a 10-meter dis- tance from the device, the music will be in the air.